Surfers Paradise is the absolute worst. Not only was the tackiest part of Australia full of spotty-faced teenagers on summer holiday when I visited in November last year, but you couldn’t even take refuge from all their youthful hijinks in a decent bar or pub because there weren’t any. It seems they’re all either tourist traps or rat holes. So Mrs Best Beer HQ and I dropped by a little bottle shop in the CBD and picked up some drinks to take home to the apartment we were staying in. Gage Roads Brewing’s Break Water pale ale was one of those drinks. Blurb on the bottle: A beer best paired with lazy afternoons, watching the sun sink into the ocean from the gateway to Freo – South Mole. Crafted with 100% Australian malts and hops, it’s light-bodied, dry, and we bottle it unfiltered for flavour and freshness. Brewed by the fussy bastards at Gage Roads Brewing Co. in Perth, Western Australia. Tastes like: A beer best paired with low expectations. Boy oh boy, these Australian pale ales can be very pale indeed. Where are the hops? The caramel? The fruit? Break Water’s Australian pale ale is far too restrained for my liking. It’s light, thin, with very slight bitterness and a painfully bland finish. Put it this way, it’s duller than the dullest dullard – like that one local woman who I got chatting to in one of those aforementioned “rat hole” bars I ventured into, who asked me if we have the “Muslim problem” in New Zealand. It’s no wonder why we drank back at our accommodation. 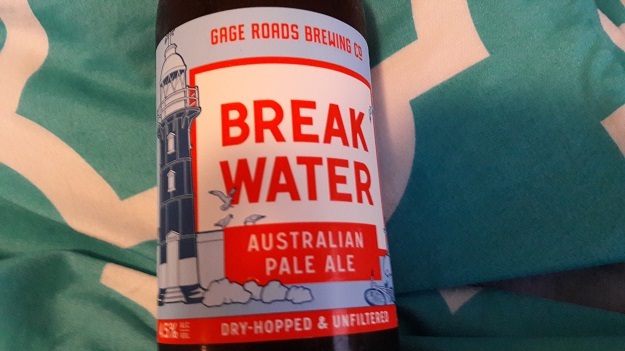 The verdict: At least Gage Roads’ Break Water Australian Pale Ale isn’t XXXX or Carlton Draught. Beer/movie combination: I don’t know if it’s the most boring movie ever made, but surely Meet Joe Black is in the top 10. This 181-minute snoozefest about Death coming to earth in the form of a very bored-looking Brad Pitt and then falling in love with human tranquilizer Claire Forlani is a guaranteed cure for insomnia.